Coordinates are an ordered set of numbers that define the position of a point. If the point is on a plane, then two numbers are used. To define the position of a point in three-dimensional space, we need three. To define the position of a point on a 2D plane, we use two numbers, called the x-coordinate and the y-coordinate. The x-coordinate tells where the point is in the left-right direction, and the y-coordinate tells where it is in the vertical, up-down direction. In the figure above the coordinates of the point A are 20, 15. 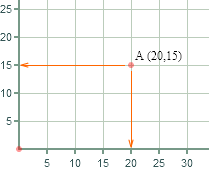 The first (x) coordinate tells how far along the horizontal (x) axis it is, here 20. The second (y) coordinate tells how far up the vertical (y) axis it is, here 15. The x coordinate is always first in the pair. For more on this see Coordinates of a point on the plane. To define a point in 3D space we add a third coordinate called z. This tells how far the point is in the third dimension. 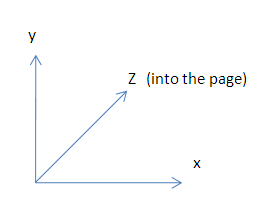 You can think of this third (z) dimension as going in and out of the page.